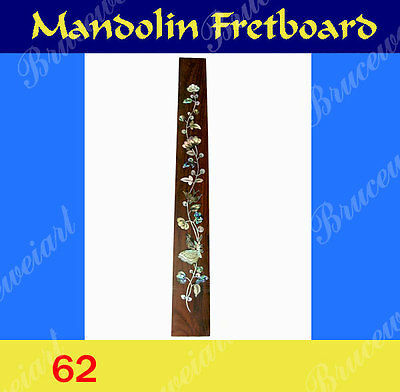 This ” Mandolin Fretboard “ was made by high quality air-dried Solid Rosewood, with gorgeous abalone and mother of pearl inlaid on it. store, there are many unique and beautiful instruments, parts listing on it. WE ACCEPT CUSTOM ORDER ! If you are not fully satisfied with this item, you can return it within 7 days with your receipt of delivery. Buyer pays all return shipping costs. Please EMAIL any questions or concerns prior to bidding. We encourage you to view our other custom made musical instrument and accessory auctions and to visit our Ebay Store.